The following process describes how a prosecution would proceed through the court system in Pennsylvania. An act is committed by an adult or juvenile in violation of certain enumerated laws of the Commonwealth of Pennsylvania such as the Crimes Code, Motor Vehicle Code, the Pharmacy Act, etc. If police are not present at the time and location of the criminal act, they are contacted by victims or witnesses, often through the Allegheny County 9-1-1 Dispatch Center. Investigation may include interviewing the victim, witnesses and/or suspects; collecting physical evidence; visiting, viewing, photographing and/or measuring the crime scene; and identifying suspects through photo arrays or line-ups. After an alleged crime is investigated, the police initiate the criminal process by filing a complaint with the appropriate Magisterial District Judge or by making a warrantless arrest (referred to as an “on view” arrest) followed by the filing of a complaint. The complaint identifies the defendant, lists the crimes charged and contains a brief factual summary upon which the charges are based. If an arrest warrant is issued, or if the process was initiated by a warrantless arrest, the defendant must appear before the Magisterial District Judge for a preliminary arraignment. At this proceeding, the defendant is provided with a copy of the complaint and advised of his or her rights; also at this time, bond is set. Additionally, a preliminary hearing is scheduled, not less than three days but not more than ten days after the preliminary arraignment. The District Attorney usually will not be represented at a preliminary arraignment. The preliminary hearing is also convened before a Magisterial District Judge. At the preliminary hearing, the Commonwealth is required to present a prima facie case or, in other words, evidence that a crime has been committed and that the defendant is probably the perpetrator of that crime. 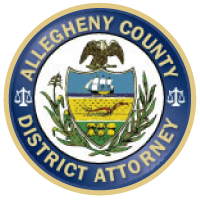 Although the police officer may prosecute the preliminary hearing before the Magisterial District Judge, in Allegheny County an Assistant District Attorney will usually appear and present the case on behalf of the Commonwealth. If a prima facie case is presented, the case will be held for court. If a prima facie case is not presented, the defendant should be discharged. After holding a case for court, the Magisterial District Judge will send notice to the Allegheny County Department of Court Records. They will notify the District Attorney of the charges that were held for court. The District Attorney’s Office will then file a formal charging document, called an information, with the Department of Court Records. The information lists, in specific and numbered counts, the offenses charged against the defendant. At this stage, the District Attorney may exercise discretion and terminate the prosecution by declining to file an information or by adding or deleting charges. The next proceeding is the formal arraignment. The District Attorney usually will not be represented nor will a Judge be present. The defendant is provided with a copy of the information and advised of his and her rights, including his or her right to file pretrial motions. Pretrial motions must ordinarily be filed within thirty days of the formal arraignment. It is the obligation of the District Attorney’s Office to respond to the defendant’s pretrial motions. In addition, the defendant is given notice to appear for his or her pretrial conference. Also, at the formal arraignment, a Court of Common Pleas Judge is assigned to the case. The next step is the pretrial conference. Generally, the defendant and his or her lawyer and an Assistant District Attorney will appear before the assigned Judge and a trial date will be selected. At this time, the defendant will elect to plead guilty, or proceed to a jury or non-jury trial. Other pretrial matters also are addressed at the pretrial conference. A defendant may waive his or her right to a trial and enter a guilty or nolo contendere plea. A guilty plea may be entered with or without an agreement with the Assistant District Attorney as to the charges and/or the sentence. A defendant entering a plea of not guilty may choose to be tried by a jury of twelve citizens or by the Judge alone. At trial, the case for the Commonwealth is presented by an Assistant District Attorney who must establish the defendant’s guilt beyond a reasonable doubt. The defendant is under no obligation to present evidence or testimony but may do so if he or she wishes. If tried by a jury, the jury must return a unanimous verdict; if tried by a Judge (non-jury trial), the Judge must return the verdict. If a defendant is found not guilty, he or she will be immediately discharged. If found guilty, the defendant may be sentenced immediately or sentencing may be deferred pending a pre-sentence investigation into the defendant’s background. If sentencing is deferred, the defendant is subsequently returned to court and sentenced. Residents of Allegheny County are randomly selected from lists such as state drivers’ license records and/or voter registration rolls, and are summoned on a daily basis to the Courthouse as potential jurors. A blind draw selects a group of people from that group. The Judge, Assistant District Attorney and defense attorney voir dire, or question, the jurors about their backgrounds and beliefs. The attorneys are permitted a limited number of “peremptory” challenges to various jurors and an unlimited number of challenges for good cause; the number of peremptory challenges depends on whether the defendant is charged with a misdemeanor, felony or homicide. After twelve acceptable jurors are selected, the Judge administers an oath to the jury and reads basic instructions about the trial process. Alternate jurors are also selected in the event a juror is excused by the Judge during the trial. The Assistant District Attorney gives an opening statement to outline the case and evidence to the jury. The defense may give a similar opening statement, or wait until later in the trial. The Assistant District Attorney calls witnesses, after which the defense may cross-examine the witnesses. The Assistant District Attorney rests, or closes the Commonwealth’s case. The defense may call witnesses, if it desires to do so, and the Assistant District Attorney may cross-examine the defense witnesses. At the conclusion of presenting its case, the defense rests. The Assistant District Attorney may present “rebuttal” witnesses or evidence to challenge evidence presented by the defense during its presentation of evidence. The defense may present “surrebuttal” witnesses or evidence to challenge the prosecution’s rebuttal witnesses or evidence. At the conclusion of all the evidence presentation, both parties rest. The defense attorney presents a closing argument to the jury. The Assistant District Attorney then presents a closing argument to the jury. The Judge gives the jury detailed legal instructions about the charged crimes, the deliberation process and other matters of importance. The jury then leaves the courtroom and is led directly to a jury deliberation room where they discuss the case and attempt to reach a verdict. If the jurors cannot reach a verdict, the Judge will declare a hung jury and dismiss the jurors. The Assistant District Attorney may present “rebuttal” witnesses or evidence to challenge evidence presented by the defense during its presentation of evidence. The defense may challenge the rebuttal evidence presented by the Commonwealth with “surrebuttal” evidence. The defense attorney presents a closing argument to the Judge. The Assistant District Attorney presents a closing argument to the Judge. A defendant may choose to waive his or her right to a trial and enter a plea of guilty, in which the defendant admits his or her guilt to the crime(s) charged. If a defendant elects to plead guilty, a plea date will be scheduled, at which time it will be determined that the defendant is knowingly and voluntarily entering a plea of guilty to the charge(s) against him or her. An Assistant District Attorney will appear at the guilty plea hearing and represent the Commonwealth. Once the Judge accepts the plea, the defendant may be sentenced immediately or sentencing may be deferred pending a pre-sentence investigation into the defendant’s background. If sentencing is deferred, the defendant is subsequently returned to court and sentenced. A defendant may choose to enter a plea of nolo contendere, which has the same legal effect as a guilty plea. This type of plea means the defendant does not contest the facts of the case entered on the record by the Assistant District Attorney. The Probation Department of the Court of Common Pleas prepares a report for the Judge summarizing the crime, and the defendant’s personal and criminal backgrounds. Generally, in cases involving a victim, the victim is asked to make an impact statement to be included in the report. Sentencing in Pennsylvania varies with the crime and can be the most confusing part of the criminal process. Most often, sentences are at the Judge’s discretion; however, in Pennsylvania there are a number of mandatory minimum sentences that must be imposed if a defendant is convicted of a specified crime. At the time of sentencing, the Judge will consider the information in the presentence report before determining the sentence. The parties may correct factual errors in the presentence report and offer additional evidence relevant to the Judge’s sentencing decision. The victim, or family member of the victim, may attend the sentencing proceeding and submit to the sentencing Judge a victim impact statement, either orally or in writing. The Judge will also consult the “sentencing guidelines” (established by the Pennsylvania Commission on Sentencing) as a reference for framing an appropriate sentence. The Judge will consider facts surrounding the commission of the crime and the defendant’s criminal background to determine the minimum jail/prison sentence. The Judge will consider different alternatives, such as a fine, probation, community service, a sentence to jail or prison, or a combination of these options. The Judge may also order the defendant to make restitution to any victims who have suffered financial harm. Additionally, sentences may include alternative housing, house arrest, electronic monitoring or work release. Once sentenced, the defendant has a choice of seeking review in the trial court or through an appeal to an intermediate appellate court, called the Superior Court of Pennsylvania. If review is first sought in the trial court and denied, the defendant may then appeal to the Superior Court. Not all cases on appeal are granted an argument. If the defendant’s appeal to the Superior Court is unsuccessful, the defendant has a discretionary appeal to the Supreme Court of Pennsylvania. The District Attorney’s Office will answer the defendant’s appeal by filing the appropriate response, called a responsive pleading. In general, the defendant and the Assistant District Attorney file briefs that summarize the case facts, frame the legal issues to be decided, and present persuasive written arguments (supported by constitutional, statutory or prior case decision authority). After the briefs are filed, the case is scheduled before the appellate court for oral argument. The appellate court will eventually issue a written opinion (or several opinions, if the Justices disagree). Defendants have a limited right to a collateral review of their conviction through the Post Conviction Relief Act. This action commences in the Court of Common Pleas and review can thereafter be sought in the Pennsylvania appellate courts. Defendants may also seek federal review of their state convictions by filing a petition for a writ of habeas corpus in the appropriate Federal District Court. The District Attorney’s Office will file answers to these collateral petitions where appropriate.